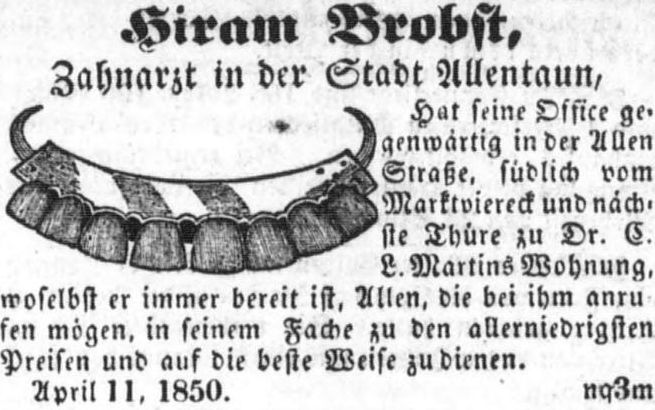 Hiram Brobst’s dental office advertisement (Der Lecha Caunty Patriot, 18 April 1850, public domain). The early to mid-19th century was a great time to be alive for many Americans. An era of expansion both geographically and economically, new social adventures for men and women blossomed as many communities were transformed from largely rural, agrarian ones to bustling business centers boosted by the dawn of the nation’s Industrial Revolution. For healthcare practitioners like Hiram Brobst, the era also offered unprecedented opportunities for professional development as higher education institutions up and down the East Coast opened or expanded their existing training programs for physicians and dentists in response to new state requirements for practitioners and the development of new patient diagnostic and treatment procedures. As a result, he had the chance to make history by becoming a leader in his field within the greater Lehigh Valley. Decades after his passing, his name would still be used synonymously with the word “progress” by Allentown newspaper reporters when describing his city’s growth. Born on 10 November 1824 in Lehigh County, Pennsylvania and christened in Whitehall Township’s Jordan Evangelical Lutheran Church on Christmas Day, Hiram Brobst was a son of Lynn Township, Lehigh County native and farmer, Daniel Brobst (1795-1868) and Salome Sarah (Schreiber) Brobst (1800-1883). During the 1830s and 1840s, he resided in Lynn Township with his parents and siblings, Louisa Elizabeth (1826-1910), Amos (born sometime around 1828), Ephraim (1831-1867), Flora Ann (1838-1920), and Melecina Brobst (1844-1911). 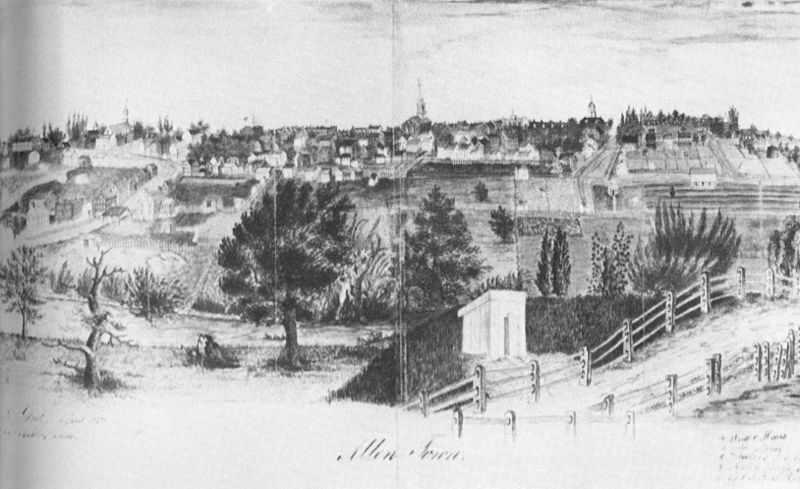 Allentown (also known as Northampton Towne, 1851, Frederick Wulff, public domain). Before the latter decade had ended, he had begun his own family and work life. Embarking on a career in healthcare, he married Margarethe Stein (alternate spellings “Margaretha”, “Margaretta”, “Margaret”) in Lehigh County sometime between 1845 and 1848. They then greeted the birth of son Charles M. (born on 4 December 1846) and daughter Anna (born sometime around 1848 and shown in later records as “Ann” or “Annie”). * Note: Although one present day source indicates that Hiram Brobst married Margarethe Stein on 7 November 1848, that year appears to be incorrect. Based on the birthdate shown on the grave marker of their oldest son, Charles (born 4 December 1846), they would most likely have wed during or before 1846. * Note: According to the American Dental Association, Hiram Brobst may have used ether when caring for patients requiring surgical interventions since use of this anesthetic was first demonstrated successfully by dentist William Morton in 1846. He also would likely have inserted cohesive gold foil as filling for cavities using a technique originated by Robert Arthur in 1855. Son Walter further brightened Brobst’s life with his arrival sometime around 1851, followed by daughters, Mary and Sallie (born respectively on 15 June 1854 and 15 August 1856). By 1860, Hiram Brobst and his wife were shown on the federal census as residents of Allentown’s 3rd Ward. Living with them at the time were their children, Charles (aged 13), Ann (aged 11), Walter (aged 9), Mary (aged 6), Sallie (aged 4), and George (aged two months). Like many Allentonians, they watched as relations between America’s North and South continued to worsen that year, and worried about their future as South Carolina led one state after another into secession, beginning in December of 1860. A 36-year-old family man and successful Lehigh County dentist at the time of Fort Sumter’s capture by Confederate forces in mid-April 1861, Hiram Brobst could have remained safely at home while others were heading off to end the Rebellion by America’s southern states. Instead, he opted to become one of the state’s early defenders, enrolling for military service at Allentown on 4 September 1861. 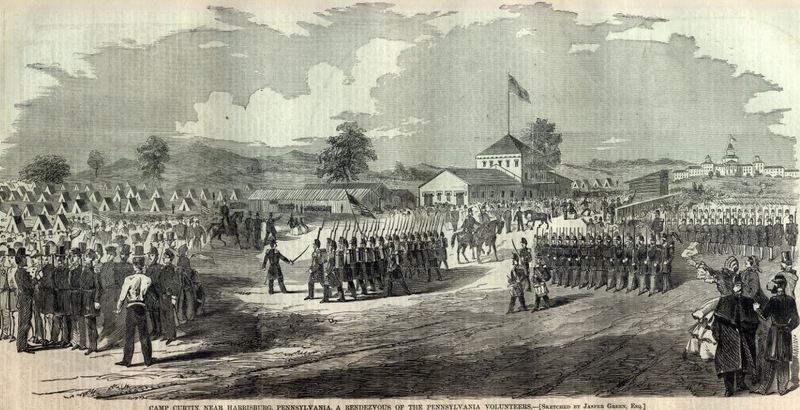 He then officially mustered in for duty at Camp Curtin in Harrisburg, Dauphin County on 18 September as a Private with Company G of the 47th Regiment, Pennsylvania Volunteer Infantry. * Note: The initial recruitment for members to fill G Company of the Pennsylvania Volunteers’ 47th Regiment was conducted in Allentown, Lehigh County, Pennsylvania, the hometown of the regiment’s founder, Colonel Tilghman H. Good. Staffed by 95 men from across the Lehigh Valley, Company G was initially led by Captain Charles Mickley, a miller-merchant and native of Mickleys near Lehigh County’s Whitehall Township. Hiram Brobst’s oldest child, Charles M. Brobst also ran off to join the war sometime that same year. Too young to be accepted for service by people who knew his real age, he headed for Ohio and, at the age of 14, enlisted as a private with Company B of the 49th Ohio Volunteer Infantry, and served for the duration of the war, including during the Battle of Chickamauga. Meanwhile, the condition of Private Hiram Brobst continued to deteriorate. As one year waned and another dawned, Dr. Baily determined that Private Brobst’s case was fatal, discharged him on a Surgeon’s Certificate of Disability effective 18 January 1862, and sent him home to die. Description of Pvt. Hiram Brobst’s Illness and Death (U.S. Civil War Widow’s Pension File, c. 1868, public domain). Hiram Brobst’s condition was so severe, in fact, that he survived just one month after his return to the Lehigh Valley in late January 1862. Diagnosed by his longtime family physician, C. L. Martin, M.D., as having an advanced case of consumption, he died at his home in Allentown on 26 February 1862. Hiram Brobst commenced complaining of a severe cold on or about the 18th day of October A.D. 1861. There being no hospital the sick were compelled to sleep in their tents. That on or about the ___ day of ___ A.D. 1861 [no data was filled in on blanks] when they had arrived at Camp Griffin Va. … [Huntsberger] took the said Hiram Brobst to Doctor Baily the Chief Regimental Physician of the said 47 Regt. who said his lungs had become affected, that he, the said Hiram Brobst also had diarrhea and pronounced his case fatal. That on or about the 18th day of January A.D. 1862 the said Hiram Brobst was sent home on the recommendation of said Doctor Baily and his discharge for disability was sent to him whilst at home. Following his untimely passing in Allentown, Hiram Brobst was laid to rest at the Union-West End Cemetery in that city. What Happened to His Parents, Siblings Widow and Children? Hiram Brobst was survived by his parents and several siblings, as well as his wife and all of his children except for his youngest son, George, who was shown only on the 1860 federal census (and who had apparently died in infancy). Hiram Brobst’s brother, Ephraim, also suffered an untimely death, passing away in 1867, while their father, Daniel, continued to work the family farm until passing away in Cetronia, South Whitehall Township, Lehigh County, Pennsylvania on 10 December 1868. Their mother, Salome Sara (Schrieber) Brobst, survived another 15 years before she too died in Cetronia – on 12 December 1883. Researchers have confirmed that Daniel Brobst rests at the Cedar Church Cemetery in Allentown, Lehigh County. Hiram Brobst’s sister, Louisa Elizabeth, wed Thomas Hartzell, and built a life with him on their family farm in Cetronia, Lehigh County. When she passed away in 1910, she was survived by five of their children: Mrs. Monroe Farringer, with whom she resided at the time of her passing, Oscar Hartzell, Percival Hartzell of Allentown, Mrs. Samuel Hoch, and Mrs. William Muse of Cetronia. Like her parents, she was interred at Allentown’s Cedar Church Cemetery. Hiram Brobst’s sister, Flora Ann, wed and raised a family in Allentown with Willoughby Hartman. When she died from kidney disease in Allentown on 10 February, 1920, she was survived by her sons John Daniel (1862-1926), Henry W. (1866-1952), and Hiram E. Hartman (1868-1948), and daughter Sarah Medina (Hartman) Butz (1864-1940), who was more commonly known as “Sallie.” Like her father and sister Louisa, Flora (Brobst) Hartman, was laid to rest at the Cedar Church Cemetery in Allentown. Hiram Brobst’s sister, Melecina, wed and raised a family with Calvin Ruch in Coplay, Lehigh County. Among their children were son Samuel and daughters Florrie, Hattie, Medina, and Sarah. Following her passing on 22 February 1911, she was laid to rest at the Egypt Cemetery in Egypt, Lehigh County. The same year that Hiram Brobst’s father died (1868), his widow, Margarethe (Stein) Brobst, was awarded a pension of $8 per month plus an additional $2 per month on 29 December for her two youngest surviving daughters, Mary and Sallie (the only two children still young enough to be eligible for such support). By 1870, Margarethe Brobst (also known as “Margaret”) was still residing in Allentown’s 3rd Ward with her children, Charles (a 23-year-old mill worker), Annie (a 20-year-old machine operator), Walter (an 18-year-old laborer), Mary (a 16-year-old shoe factory employee), and Sallie (a 13-year-old student in the local schools). Also residing at the Brobst home at this time was Margaret’s mother, Eliza Stein. The personal estates of the Civil War widow and her mother were valued by the census taker that year at, respectively, $200 and $2,800. In 1880, she was shown on the federal census as a 54-year-old widow residing in Allentown’s 5th Ward with only her seven-year-old granddaughter, Lizzie, a student in the local schools. By this time, daughters Mary and Sallie had grown up to wed, respectively, a Schwartz and an Albright while her son Charles M. Brobst had begun his own family life. Employed by the Allentown Rolling Mills and the Albright pipe factory for a significant period of his adult life, he also served his community as a charter member of the Liberty Fire Company, which was founded on 6 January 1870. Married to Sarah McLoughlin, they were the parents of three daughters and two sons, including Hiram Brobst, namesake of the Civil War veteran profiled in this biographical sketch, and Charles M. Brobst, Jr. Their daughters, following their respective marriages, were known as: Mrs. Alfred Williamson, Mrs. Charles Guldin, and Mrs. Charles Fluck. Allentown Fire Department (c. late 1800s-early 1900s, public domain). Charles M. Brobst, a well-known Civil War veteran, died at 6:30 o’clock this morning in a chair at his home, 138 North Lumber Street. Mr. Brobst had been ill for the last six weeks with dropsy. He arose early this morning and later feeling tired seated himself in a chair, where he peacefully fell asleep. He age was 70 years, 7 months and 5 days. He was a son of the late Dr. Hiram Brobst of Allentown, who was the earliest dentist in this section. Mr. Brobst enlisted for three years of service in the Civil War on August 12, 1861, and served as a Private in Co. B, 49th Ohio Volunteer Infantry. He was discharged on February 28, 1864, after a second enlistment in the same command which then became known as the Ohio Veteran Infantry. His regiment saw service throughout the extreme southwestern states and was mustered out of service November 30, 1865, in Victoria, Texas. He enlisted in Ohio, because being only 14 years old, they would not let him join the army at home. He saw hard service with Rosecrans’ army, fighting in the battle of Chickamauga and many other bloody engagements. Some years after the war, his commander, Colonel Gibson, made a campaign speech in the old Hagenbuch opera house, during the course of which he made eloquent reference to the bravery of Comrade Brobst. After the war he was for a time employed at the Allentown Rolling Mills and for many years he worked at the Albright pipe factory. He was one of the oldest members of the Liberty Fire Company, which as a charter member he helped to found. The date of his membership in the Liberty goes back to Jan. 6, 1870, a matter of more than 47 years. The company will hold a special meeting tomorrow evening to take action on his death. He is survived by his wife, Sarah M., (nee McLoughlin), and these children: Mrs. Alfred Williamson, Mrs. Charles Guldin, Mrs. Charles Fluck, and Charles, Jr., Allentown, and Hiram, Palmerton. Two sisters, Mrs. Mary Schwartz and Mrs. Sallie Albright, also survive. The funeral will be held on Thursday afternoon at 2 o’clock from his late home, Rev. Victor Boyer officiating, and interment will be made in West End Cemetery. 2. 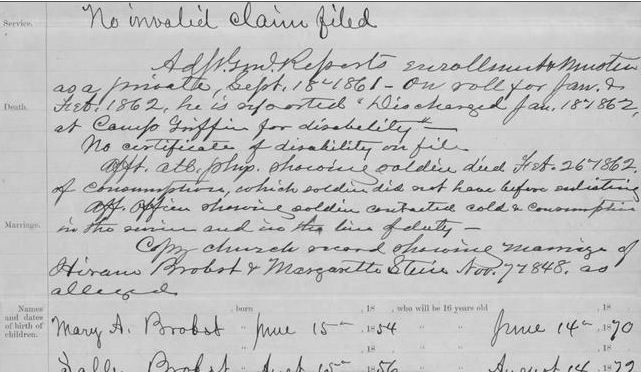 Brobst Family Birth, Baptismal, Marriage, Death and Burial Records, in Allentown Evangelical Congregation and Jordan Evangelical Congregation Church Records. Allentown and Whitehall Township, Lehigh County, Pennsylvania, 1800-1920. 3. Brobst, Hiram, in Civil War Veterans’ Card File, 1861-5. Harrisburg, Pennsylvania: Pennsylvania State Archives. 4. Civil War Veteran Dies in a Chair: Being Only 14 Years Old, Chas. M. Brobst Had to Go to Ohio to Enlist (obituary). Allentown, Pennsylvania: The Allentown Leader, 9 July 1917. 5. Hiram Brobst (child) and Daniel and Salome Brobst (parents), in Birth and Christening Records of Jordan Lutheran or Evangelical Lutheran Church, Whitehall Township, Lehigh County, Pennsylvania (FHL microfilm 940,906). Salt Lake City, Utah: Family History Library, 10 November and 25 December 1824. 6. Hiram Brobst (dental office advertisement). 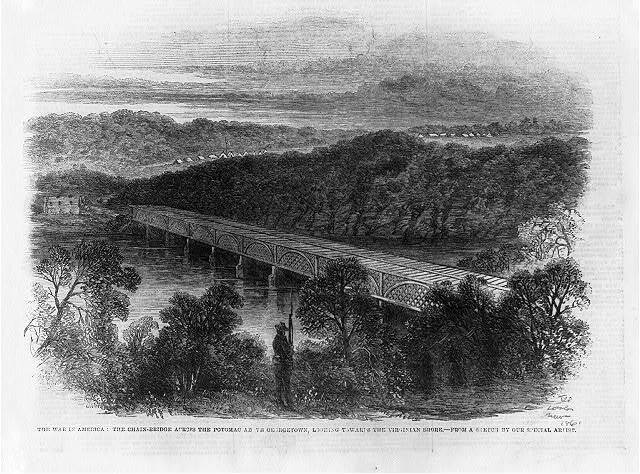 Allentown, Pennsylvania: Der Lecha Caunty Patriot, 18 April, 1850. 7. Hiram Brobst and Margaretta/Margaretha/Margarethe, Mary and Sally Brobst, in U.S. Civil War Widows’ and Orphan’s Pension Files. Washington, D.C.: U.S. National Archives and Records Administration, 1862-1917. 8. History of Dentistry Timeline. Chicago, Illinois: American Dental Association, retrieved online, 1 July 2017. 9. U.S. Census. Washington, D.C. and Pennsylvania: 1830, 1840, 1850, 1860, 1870, 1880.